Jon Moss, head teacher at Beech Hill School, Halifax with the FA Cup. FROM Horsforth to the home of football, it has been some journey for FA Cup final referee Jon Moss. A north-easterner by birth, but now an adopted Yorkshireman, Moss – executive head teacher of Beech Hill School in Halifax – will reach the pinnacle of his sporting profession later today when he referees Arsenal’s final encounter with Aston Villa at a sold-out Wembley Stadium. It is a long way from the Leeds Combination League where Moss started officiating, although the 44-year-old has always stayed close to his refereeing roots – taking charge of Wharfedale FA District Challenge’s Cup final between Ilkley Town and Otley Rovers just two years ago. The crowd which will watch Moss’s latest appointment will be somewhat higher, while the global audience across 120 difference countries who will be tuning in will be around half-a-billion viewers. No pressure then for the man in the middle. But, commendably, Moss is taking it all in his stride, although he had to compose himself somewhat when he was given the news about his blue-riband role. Horsforth-based Moss, who has been a professional referee since 2011, said: “It is the fulfilment of a lifelong dream. “Growing up as a boy, you want to play in an FA Cup final, first and foremost. But then, if you have get the chance to referee, knowing you are not going to play, the number one goal for every English official is to referee an FA Cup final. “I thought I’d have a chance of being a fourth official or have an outside chance of refereeing the game. But when you get the call from the FA to say you have been selected, it’s a wonderful feeling. “It was one of those things you don’t expect anyone to say and I had to say ‘excuse me, what did you say?’ and he repeated it and I pulled over and wasn’t fit to drive the car for a few minutes. The footballing career of Moss, who will be assisted by Darren England and Simon Bennett today, started as a young player at Sunderland, although his dreams of being a professional were subsequently dashed. After a sports scholarship in the US, Moss went to university at Leeds and fitted in playing commitments with various non-league clubs before focusing purely on refereeing when he hung up his boots at 29. Moss, who made his first steps on the refereeing road at grassroots level in his late teens, then embarked on a distinguished rise through the ranks and in 2003, he was promoted to the National Group of referees. 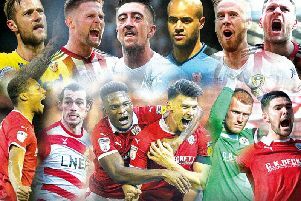 Eight years later, elevation to the Select Group who take charge of Premier League games followed and, after today’s assignment, Moss’s horizons are likely to stretch further afield. He added: “I signed as a schoolboy at Sunderland and played for a number of clubs and then played in America for a while where I had a sports scholarship at Central Connecticut University. I came back and went to university in Leeds; that’s why I ended here. “I played for Yorkshire Amateurs, Farsley Celtic and Ossett Albion and then I remember getting sent off playing for Amateurs. It was at that point that I decided it was a good time to concentrate on the refereeing after that altercation. “I served my suspension as you do and started refereeing. I started in the Leeds Combination and from there, I went to the Harrogate League and West Yorkshire League and then as you do okay, you get promoted. I progressed through to the Northern Counties and UniBond League and onto the Conference and Football League. Then, it’s the Premier League if you are lucky enough. “My first really big game was the Conference play-off final between Carlisle and Stevenage (in 2005). “But as a referee, you always remember your first game at the next level. I remember thinking I knew I was going well on Sundays if I got the Fforde Grene (Combination) and HT Sports game. “Getting into the Conference, I remember getting Accrington Stanley against Winsford and after 20 minutes, I just couldn’t catch my breath! “My first Football League game was Rochdale versus Shrewsbury and my first Premier League game was supposed to be Wigan versus Aston Villa. “I left on a Friday night in December with beautiful weather in Leeds, but I got to Wigan and there was seven feet of snow. It was the only time that a Premier League got called off that weekend because of the weather. So it ended up being Blackpool versus Birmingham. “I have also been an official in Champions League and Europa League games and doing international games, which has been fantastic. “To say I started off on Sunday mornings in Leeds, I never imagined going to the San Siro Stadium or Galatasaray. Moss has plenty of people to thank for their help along the way from across the county, from league stalwarts to high-profile names and he is hoping to do Yorkshire’s esteemed refereeing tradition proud today. He added: “The first guy who really helped was Steve Andrews in the Combination League and he gave me the encouragement to move on. Coming through the ranks, I had Trevor Simpson from Halifax, who was a great coach and mentor. “At the higher end, the likes of Martin Atkinson and Howard Webb have coached me through along with Eddie Wolstenholme and Mike Riley, who has been a great help. Moss and his family travelled to the capital yesterday and he will certainly not be short of personal support. Further down the line, do not bank against another Moss officiating in the middle in the years to come, with his eldest child Joe also embarking in his father’s footsteps by starting out on the refereeing road. Moss said: “My daughter Madeline and three boys Joe, Josh and Noah and my wife Julie are all coming and it’s cost me a fortune in outfits! “My mum and dad, who have cancelled their holiday, and my mother-in-law and father-in-law will also be there. “The boys are all football mad and my eldest son Joe has also qualified as a referee, so he is involved. They all play for Horsforth St Margaret’s. “For me, it’s another stepping-stone in my career and is undoubtedly the biggest game of my career and will, hopefully, lead to other big games really. “I remember refereeing the Wharfedale FA Senior Cup final a few years ago and now it’s the FA Cup final.